Home Videos World Love Thy Neighbour? Video Of The Jerusalem Brawl. Love Thy Neighbour? 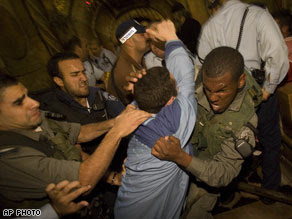 Video Of The Jerusalem Brawl. This sort of makes one wonder what the world is coming to - Christians brawling over areas of the traditional site of Jesus' crucifixion... but according to all reports, fights are not uncommon in the Church of the Holy Sepulchre among the representatives of Christian denominations who are responsible for maintaining its different chambers. Greek Orthodox and Armenian worshippers traded blows in the Church of the Holy Sepulchre in Jerusalem. Israeli police moved into the shrine, which many of the faithful believe contains the tomb of Jesus, to restore order and apparently arrested two clerics. Dozens of worshippers took part in the melee - in the red corner, the Greek Orthodox and in the blue corner, Armenian denominations. But this was no gentleman's boxing match - the groups traded kicks and punches, knocking down tapestries and toppling decorations at the site in Arab East Jerusalem. "The brawl erupted during the Feast of the Cross, a ceremony in which the Armenian community commemorates what it believes was the fourth century discovery of the cross upon which Jesus was crucified". Someone forgot to tell them - "LOVE THY NEIGHBOUR" ! !